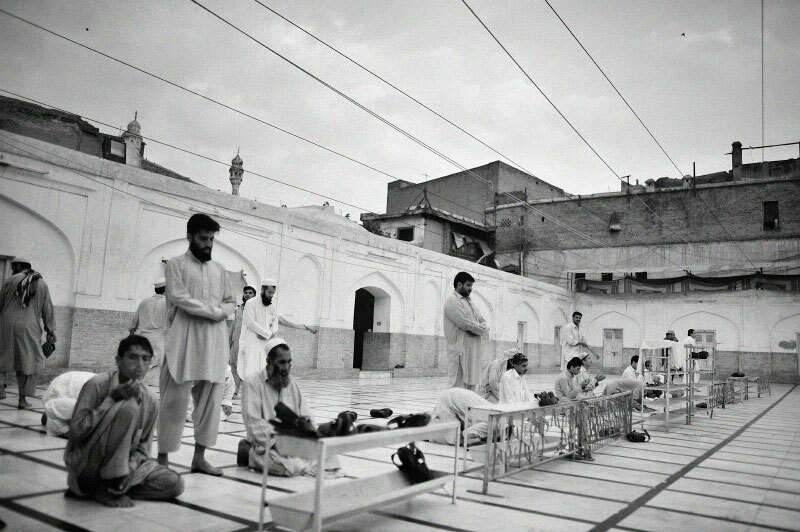 Pakistani and Afghani Men pray during Magreb, or sunset prayer at the Mahbad Khan Mosque in Peshowar, Pakistan, July 2008. Since the start of the American-led war in Afghanistan in 2001, the Taliban has gradually infiltrated the tribal areas of Pakistan, and some parts of Peshowar, itself, and many come into Peshowar from the tribal area, increasing tensions in Peshowar, and making it a much more conservative city than before the war. The Taliban puts pressure on Pakistanis to be better, more devout Muslims, forcing many women under the all-concealing burqua, and influencing many men to attend prayer in one of the many the mosques throughout the city.